The great thing about this recipe is that it tastes just as delicious as traditional spinach pie, but requires less than ¼ of the work. Enjoy them while they’re piping hot and still wonderfully crispy on the outside and gooey on the inside. I like mine simple and vegetarian, but you can also add some chopped olives and pepperoni if you’re feeling indulgent. In a large pot heat 2 tablespoons olive oil and sauté the garlic and red pepper flakes over medium heat for about 1 minute; do not let the garlic brown. Add all of the spinach and salt, toss it with the oil, cover the pot, and cook it for 2 minutes. Uncover the pot and cook the spinach for an additional minute until all the spinach is wilted. Stir in the lemon juice. Using a slotted spoon, remove the spinach from the pot, leaving any excess liquid behind. 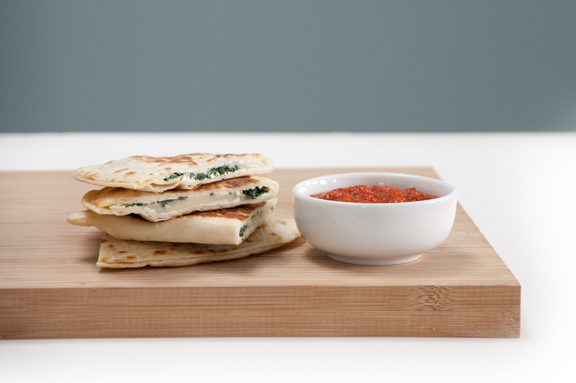 Spread the flour tortillas out on a work surface and spread a layer of ricotta cheese on each of them. Scatter the spinach over the ricotta and then sprinkle with the shredded mozzarella. 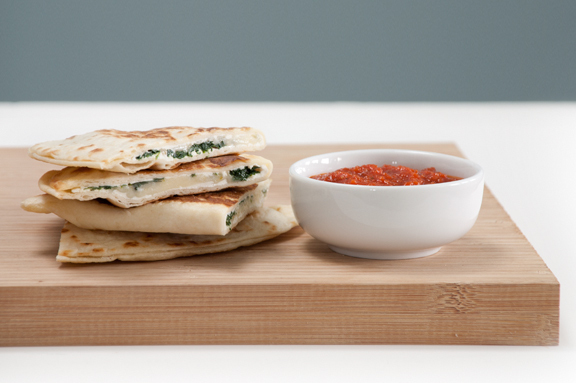 Fold each tortilla in half to form 8 half round quesadillas. Heat a large sauté pan over medium heat. Coat the pan with a bit of olive oil and add 2 quesadillas. When the bottoms have turned golden brown, carefully turn each quesadilla over and then brown on the second side. Remove the quesadillas from the pan, and put them in a 200 degree oven to keep warm. Add a bit more oil to the pan and then repeat with the remaining quesadillas. Cut each quesadilla in half and serve with marinara sauce for dipping.